Country bumpkin Chris Harvie attended a tattoo at Jozi’s Tuscan Palace, where he enjoyed the full Monte treatment. Bagpipe music skirled through the flag-decked streets of Montecasino as we made our way to the arena. Upturned faces, many pale and freckled betraying Gaelic roots, looked wistfully to the roof-painted sky, whence the call of the pipes seemed to emanate, and smiled. Let the show begin. And what an impressive event it was. Proudly South African, with no fewer than twelve acts made up a cast of 800 performers marching and drumming and piping their way in and around and through each other whilst an enthralled crowd, encouraged to make as much noise as possible to egg on the performers, did just that. We cheered and stomped and clapped Highland dancers, Irish dancers, Indian dancers, acrobats, the South African Military Health Service Band (yes, there is one) and even the Harley Owners Group of Johannesburg, who made almost as much din as the legendary and unearthly Haggis and Bong electric guitar and bagpipe combo, another highly entertaining act. Away from the ceilidh and the pipe bands, we had booked into Montecasino’s five-star Palazzo Hotel, where we had been greeted on arrival by a flurry of friendly faces, bearing cold drinks, hurtling us through the paperwork and then whisking our bags to our rooms. One forgets how good Tsogo Sun is at these things. When I booked, they confirmed me, unasked, onto a weekend breakaway deal which included all sorts of fascinating extras and freebies to ensure that we made the most of our stay. And we did. With the tattoo now firmly under our sporrans, it was time to take in the rest of what the bright lights of Montecasino had to offer the bedazzled bush band. We went ten-pin bowling, we played in the entertainment arcade, we drank world-class coffee at Fego, we enjoyed an excellent curry at Raj and we watched bands and street players doing wonderfully clever things on every street corner. Montecasino is a Wonderland. It has the feeling of an imaginary world in a vast indoor stadium. We half-expected a dozen Mary Poppinses to come floating down from the concrete ether, as they did in London’s Olympic Games Opening Ceremony, and take on Lord Voldemort. We didn’t use the free movie tickets but we’re saving them up for another time and we’d already paid to go into the Bird Garden when we realised that we had free tickets, so we went mad and went twice. It was a highlight. I am somewhat ornithophobic and although I have no problem with birds in the outside world, wandering around under shadecloth surrounded by strutting, poeping, flapping creatures is really not my bag. Having said that, Montecasino’s Bird Gardens didn’t worry me in the least. In fact they may have cured me. Huge tented aviaries are home to an eclectic range of multi-coloured birds of all shapes and species. The most colourful, the scarlet ibis, is an astonishing bright red, but there were many other beauties to ogle: turacos, cranes, peacocks, ducks, geese and parrots with a smattering of monkeys, snakes, oversized geckos and lemurs to calm the nerves between avian dive-bombings. The stars of the show are the birds which take part in the live demonstration, where handlers lure owls, a toucan, a pelican and a ground hornbill into swoops and waddles in the purpose-built arena. It’s good wholesome fun – and when you have had your fill of gawping, you can get up close and personal with a bunch of lorikeets. Buy your nectar on the way in and these colourful little chaps while climb all over you to get their beaks into it. A hat is recommended! All in all, whether you are coming from out of town to spend a night at one of Montecasino’s three hotels or whether you just want to pop in for the day, it cannot be recommended too highly. It’s safe, it’s well organised, there’s plenty to do and the visitors come from all over the place. The family in front of me in the bird queue had come down from Zambia for the weekend so if you can overnight, do so. The Palazzo is superb with comfortable, spacious rooms and arguably the finest breakfast on earth. There’s a buffet and a choice of individually-cooked breakfasts; there are cereals and smoothies; there’s a parmesan the size of a medicine ball and there’s a fruit collection from around the world; there’s muesli to accompany it and a selection of seeds. Just watch out for any passing predatory birds. And this a palace, after all, so eat breakfast like a king, then go and check out what’s happening over the road in Tuscany. It may not always be tartan, but there’s sure to be somebody waving a flag and putting on a show. Where it is: Fourways, in amongst the malls, in Johannesburg’s northern suburbs. Why go there: For an in-town out-of-this-world experience and to get over any fear of birds you might have. For shows, music, good food, a family-friendly atmosphere. And there’s a casino if you are really desperate. 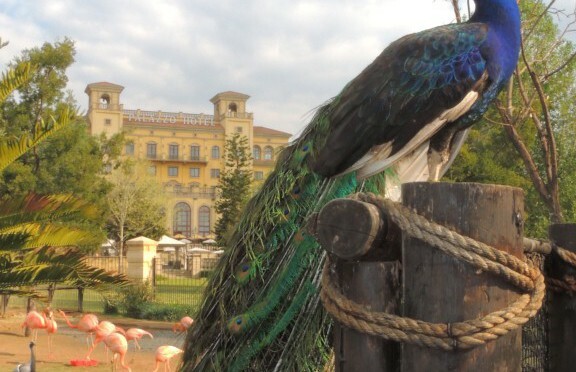 What to do: Montecasino Bird Gardens. Adults: R48. Children under 10 years: R27. Open daily from 08h30 to 17h00. Demonstrations 11h00 and 15h00 with an additional 13h00 show at weekends and on public holidays. Getting there: Access from William Nichol Drive. Blink 20 times and you still won’t miss it. What there is to see on the way: Small Tuscan mansions down every side-street and in every cluster development, in preparation for Montecasino – the real thing. Contact: Tsogo Sun reservations: 011 367 4250 or 0861 005 511 Email:montecasino.reservations@tsogosun.com. Choose between the 3* SunSquare, the 4* Southern Sun Montecasino and the 5* Palazzo. Rates from R525 per person per night. Ask about the Sunbreaks Special and special deals for children.